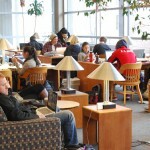 The UConn Libraries’ will open the Homer Babbidge Library for 24/7 hours early this year, starting Monday, December 2nd. Last year we met with the Undergraduate Student Government’s Academic Affairs Committee and they provided feedback indicating that students are as busy, if not busier, the week before finals as they are during finals. So instead of Friday, December 6th, we will open our doors on December 2nd and stay open until Sunday, December 15th at 6pm. That is a total of 330 hours straight. Phew! 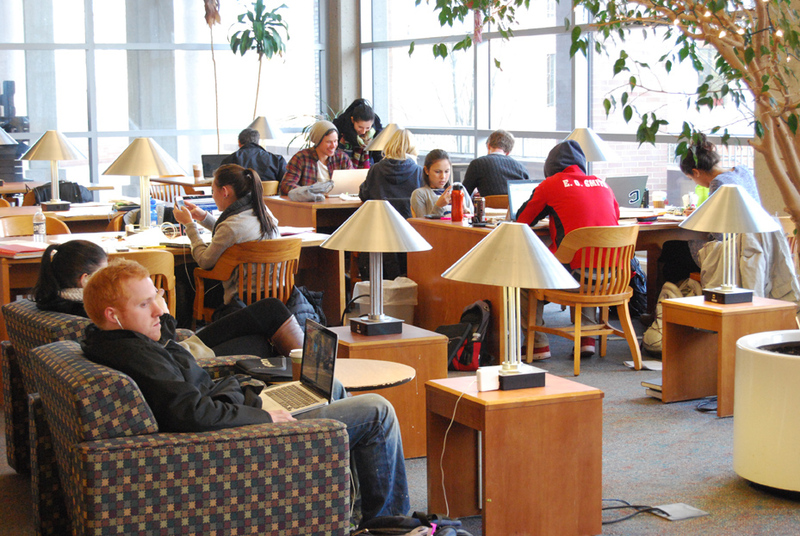 Good luck to all UConn students on completing your semester and acing your finals! 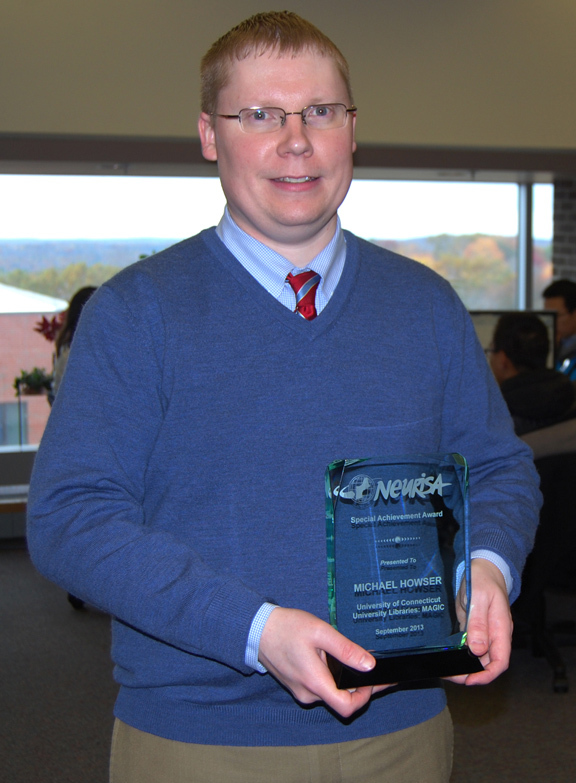 Library staff Michael Howser was recently awarded the New England Chapter of the Urban and Regional Information Systems Association’s (NEURISA) Special Achievement Award at their Annual Conference in September. The award is given to an individual who has made a significant contribution that greatly enhances the efficiency and effectiveness of an organization through the use of geospatial or other information technologies. Bestselling children’s authors Tomie de Paola and Steven Kellogg joined the UConn Co-op at the 22nd annual Connecticut Children’s Book Fair. Three children browse through books available at the Children’s Book Fair in the Rome Ballroom on Sunday. The Children’s Book Fair is an annual event hosted at UConn, providing authors an opportunity to bring their works to life for children from across the region. This year, 27 authors and illustrators joined together with the University of Connecticut Libraries and the UConn Co-op to create a place where children’s book characters such as Strega Nona and Clifford come to life and inspire children to pursue their passion for reading. Davey’s mother, Thany Litrico, a 2006 UConn graduate from the School of Nursing, said that the event really “helps kids get excited about reading” which is so important for success in school. A wide variety of books were available for purchase including board books for toddlers, picture books and novels for young adult readers. Many of the authors whose works were featured, were also in attendance and signed books for fans. The authors also gave panel discussions throughout the day aimed at parents and UConn students. Children were entertained by a menagerie of characters including Stega Nona, Clifford and Spot the Dog. Local volunteers ran a craft station where children could construct and decorate paper crowns. According to author Robert Forbes, who was joining the book fair for his third year, the event has “tremendous energy.” Even though Connecticut isn’t exactly next door to his home state of Florida, Forbes says he “wouldn’t miss this event for anything.” He believes that helping to interest children in stories and reading as early as possible will only benefit them later in life. “These kids will all have a leg up in life because their parents read to them,” he said. The book fair works to inspire children in the realm of literature. Kayla, who has been attending the book fair since she was only a year old, was so excited to be back this year for her 13th time. During the duration of the book fair, various panel discussions were held in addition to other children’s literature themed events. Bridging the divide between children’s literature and the university, UConn illustration students were invited to submit work to win the Raab Prize in illustration. The works were created for a poem by children’s author Jane Yolen and were critiqued by author and illustrator Jarrett Krosoczka. Krosoczka critiqued aspects of the illustration such as placement of the text in relation to the art as well as the content of the artist’s work. Authors presented on a variety of topics, including one called “This is Teen” which focused on teen literature and bringing teenage readers closer to the authors who produce their favorite works. The panel was moderated by author Elizabeth Eulberg, author of “The Lonely Hearts Club” and featured authors Jeff Hirsch, author of “The Eleventh Plague,” Alaya Johnson, author of “Moonshine” and Michael Northrop, author of “Trapped.” All three authors write primarily for teens and contributed in sight on the subject of writing for a teen audience and connecting with teenagers.